If are in need of some ultra luxurious giftware or jewelry that will impress even the most refined taste, the Buccellati sample sale should be on your radar. The famed Italian jewelry designer makes approximately 3,000 pieces of jewelry per year, 500 or so of which are one-of-a-kind pieces. Their exclusivity and quality workmanship contributes to their hefty retail prices. Buccellati rarely goes on sale and holds its value extremely well; we couldn’t resist the opportunity to scoop up sterling tablewear, hollowware, flatware and gifts for around a 50% cut. Inside the sale we found lovely sterling candlesticks mostly priced between $6,000 and $12,000. The most impressive piece, however, was a huge sterling serving tray discounted just over 50% to $20,000 from $44,200. A large silver ice bucket is now $4,200 from $9,000. The sale also includes some more wallet-friendly gift ideas. 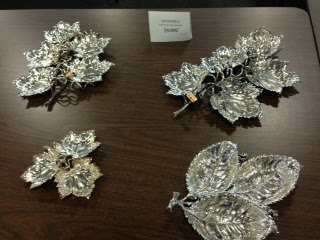 Small grape dishes are on sale for $425 from $850. If you're interested in gifts for yourself you will be happy to find jewelry discounted about 40% off retail. Their impressive selection of signature flower blossom necklaces in silver are priced from $575 to around $1000. Most of the 14K yellow gold collection and watches are still pricey, ranging from $15,000 to $80,000. Who can honestly pass up a yellow gold flower blossom necklace at the relative bargain price of $21,000 from $35,000? The sale also includes a good selection of brooches and a small selection of rings, earrings and bracelets. As you can see, Buccellati is big pucks but these items really hold their value when you're making purchases at these sort of discounts.